The Rhode Island Department of Environmental Management (DEM) salutes the three individuals and two organizations from Rhode Island who were recognized yesterday at the US Environmental Protection Agency's (EPA) New England 2018 Environmental Merit Awards ceremony. They were among 28 recipients across New England honored at Boston's Faneuil Hall for their work to protect New England's environment. "It is an honor and a privilege to recognize today's Merit Award recipients and celebrate the important work these outstanding individuals and organizations do every day to protect our environment for the benefit of all," said DEM Director Janet Coit. "Their talents and tenacity and vision are inspiring. To quote Robert Frost, 'And that has made all the difference.' I'm heartened and thrilled to celebrate their successes with our colleagues throughout New England." EPA Region 1 each year recognizes individuals and groups in the six New England states who are distinguished by their work to protect or improve the region's environment. The Environmental Merit Awards, given since 1970, highlight work or actions done in the prior year and awarded in the categories of individual; business (including professional organizations); local, state or federal government; and environmental, community, academia or nonprofit organization. Also, each year EPA presents lifetime achievement awards for individuals. Terrence Gray, RI Department of Environmental Management, Providence Appointed in 2013 as the first associate director for environmental programs at DEM, Terrence Gray has authority over programs covering the bulk of DEM's regulatory work and many other programs. Gray, who oversees 160 employees, began at DEM in 1987 as an engineer, served as chief of the Division of Site Remediation; chief of the Office of Waste Management; and assistant director for Air, Waste, and Compliance. He was pivotal in many successful efforts to clean up hazardous waste, redevelop former industrial sites, close landfills, stop illegal dumping, and improve waste management and recycling. He now leads DEM work on emerging contaminants. Gray is the "go to" person for businesses and other applicants confused by permitting processes. In 2018, Gray kicked off a New Employee Cross Training Program for DEM's newest employees with the goal of ensuring new employees understand work done in DEM's Environmental Protection and Natural Resources bureaus and can serve as ambassadors of all the Department's goals, no matter in which program they serve. Gray also has been instrumental in partnering with both the Rhode Island Society of Environmental Professionals and the Environmental Business Council of New England to enhance the relationship between DEM and both regulated communities and environmental professionals. Gray has been a leader in strategic planning and regulatory reforms. He has been the lead advocate for improving internal processes, making DEM the state leader on Lean. His work to identify waste ensures permitting processes are clear, predictable, and reliable. Gray is a "servant leader," and a wonderful partner and colleague. Wenley Ferguson, Save The Bay, Providence Since 1990, Wenley Ferguson, Save The Bay's restoration coordinator, has used her expertise, can-do spirit, and collaborative nature for her work protecting habitat, assessing water quality and restoring the Narragansett Bay and its watershed. Ferguson's projects have included salt marsh, anadromous fish, and coastal buffer restoration projects and restoration monitoring. Recently, Ferguson has focused looking at how rising sea levels are affecting salt marshes. She documented regional impacts of sea level rise and, working with others, found techniques to improve marsh health as sea level rises. Ferguson works to protect marsh migration corridors through easements and removing barriers to migration. She has put in place projects to regrade eroding banks and has removed infrastructure vulnerable to flooding and erosion to enhance coastal habitats and public access. Ferguson works with others to install rain gardens and complete other projects that filter stormwater. Recently, she installed stormwater filtration and infiltration structures on coastal roads that are susceptible to tidal flooding and erosion. She involves community volunteers in monitoring, planting, and maintenance. An effective advocate for Narragansett Bay and its environment, Ferguson for 30 years has tackled challenges to its ecological health. She is skilled at mobilizing people to protect and restore the bay. Pawcatuck River Restoration Project, Hope Valley Wood-Pawcatuck Watershed Association The Nature Conservancy – Rhode Island Chapter The efforts of the Wood-Pawcatuck Watershed Association and The Nature Conservancy's Rhode Island Chapter restored a passage for fish, improved the flow of water, upgraded water quality, and reduced flood risks. Five dam removals and river restoration projects in the last decade have left the headwaters of the Pawcatuck River open to spawning of migratory fish for the first time since colonial development of mills and dams there. This was made possible by more than $10 million of government funding, the leadership of the Wood Pawcatuck Watershed Association and The Nature Conservancy and the efforts of landowners and citizens. Among the projects, the Lower Shannock Falls Dam was removed and a natural river channel and a riverside park were created. 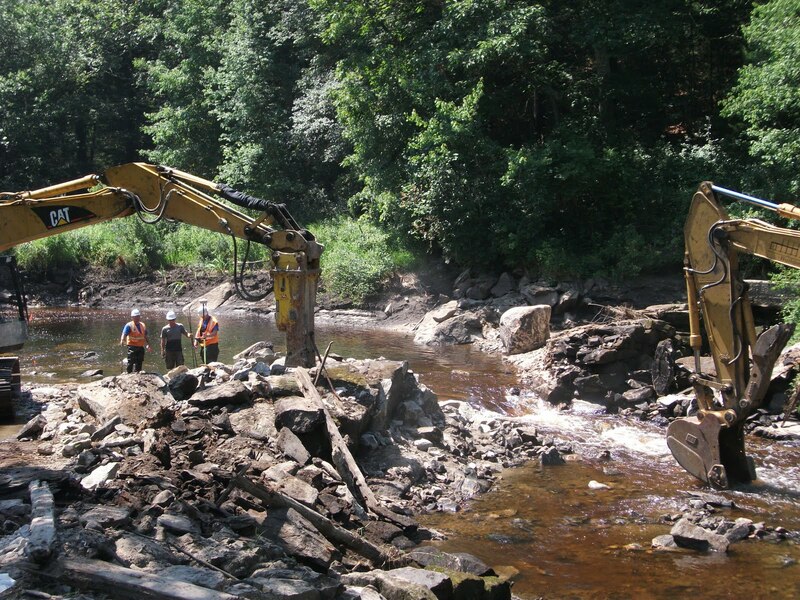 Another project involved removal of Kenyon Mill Dam and construction of a pool and rock ramp next to a textile mill. Beyond the new spawning grounds and improved passage provided to migratory fish, these projects have reduced flood risks. They also have provided safe boating passage and improved the river for fishing. These restoration projects reflect the desire of the association and watershed communities in Rhode Island and Connecticut for the Wood-Pawcatuck rivers system to be designated as a Wild & Scenic River under the US Department of Interior National Park Service. This effort is approaching the final stages to achieve designation. Volvo Ocean Race Newport Stopover Team, Newport Jeremy Pochman, Robin Clegg, Brad Read, Dave McLaughlin The Volvo Ocean Race, which covers 45,000 nautical miles over four oceans, stopped in Rhode Island for 12 days in May, attracting more than 100,000 visitors to Fort Adams State Park in Newport. Sail Newport, a local non-profit and official host in Newport, as well as Volvo Ocean Race, 11th Hour Racing, Clean Ocean Access, and Mega Disposal were nominated as a group for their combined focus on ocean health. The theme of this year's sustainability program was "Turn the Tide on Plastics." For the first time, two boats collected data on water quality and plastic concentrations in some of the remotest parts of our planet while competing in the race in which participating sailboats can attain speeds of more than 30 MPH. The Newport stopover featured the fourth annual Ocean Summit, which was so popular that more such summits were planned and held during this year's race to showcase innovative solutions to the plastic crisis. The non-profit, 11th Hour Racing, which works with the sailing community and maritime industries to protect and restore ocean health, organized the summit. Host communities and businesses were urged to sign a pledge to work to reduce pollution, and Rhode Island was the first state to take the pledge. Clean Ocean Access, a Newport-based non-profit, led the Sustainability Committee, which put in place systems to eliminate single-use plastics, minimize the event footprint, and divert thousands of pounds of waste from landfills. Hundreds of volunteers were involved. City of North Providence Mayor Charles Lombardi Water utilities have reduced lead exposure by installing corrosion control treatments. In recent years, public health and regulatory agencies have focused on replacing lead service lines to reduce lead exposure in drinking water, which, in children, can result in neurological and developmental damage. This means addressing complex issues that require the involvement of the community and significant cost. Most lead service lines are owned partly by the water utility and partly by property owners. North Providence, with mostly moderate to low-income families, has more than 500 lead service lines. Under the leadership of Mayor Charles Lombardi, the city has leveraged federal HUD funding through the state Office of Housing and Community Development. In North Providence, these funds, which municipalities typically invest in low income neighborhoods, were used creatively to obtain $270,000 to replace privately-owned lead service lines. The city will replace the publicly-owned lead service line for every private line replaced. North Providence knocked on doors to get residents to participate. This led to replacing about 40 lead service lines. Then the city held public forums and now plans to replace about 100 lines in 2018. Under Lombardi's vision, a creative solution was found and important public health changes made. Challenged by daunting numbers of lead pipes, North Providence is an inspiration to other communities wanting to eliminate lead pipes and protect their children. Follow DEM on Twitter (@RhodeIslandDEM) or Facebook at www.facebook.com/RhodeIslandDEM for information on DEM programs and services and other timely updates.